We’re back and we’re starting a cult. No, worse than that — we’re starting three of them! 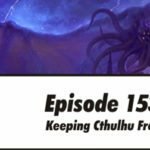 Last episode, we looked at how real religions and their practices might inform our depiction of Mythos sects in Call of Cthulhu. Now we’re taking things one step further. Building on what we’ve learnt, we try to picture what life might look like from within these sects. Then we create three Mythos sects of our own, trying to use our understanding of religion to give them more complex agendas and practices than the usual sacrifices and summonings. We also offer some context by talking about our own religious backgrounds and how they might have shaped our beliefs and prejudices. We’re traditionalists, on the whole. 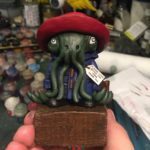 As Matt mentioned recently, on this very site, he has been asked by Delphes Desvoivres to write a Call of Cthulhu scenario as part of the Idol of Cthulhu Kickstarter campaign. 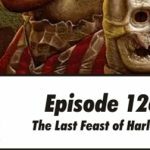 This scenario will be a follow-up to Lovecraft’s story, The Call of Cthulhu, running approximately 20,000 words. It may grow to a more cyclopean stature, depending on stretch goals. The campaign ends on the 27th of December, so act quickly if you want your New Year to be filled with unhallowed idolatry. You may have seen posts in your social media feeds expressing dissatisfaction with Patreon’s new charging scheme. Patreon have shifted their fees from content creators to patrons, increasing them in the process. While there seem to be some understandable reasons for this, they have handled the entire situation poorly. More importantly, it disproportionately hurts backers who make smaller pledges. As a result, we are currently investigating alternatives to run alongside Patreon, allowing greater choice for backers. We will keep you posted as this develops. There will be a slight delay in getting issue 3 of The Blasphemous Tome fanzine to our Patreon backers. We received the first batch of the print run late last week, only to discover that it was missing four pages. Getting this resolved shouldn’t take too long and we still hope to get the Tome to most of you before the end of the year. Some backers will receive their Christmas cards ahead of the Tome, as we didn’t want to miss last posting dates. If your envelope is suspiciously Tomeless, don’t worry — our unspeakable blasphemies shall take to the ghoul winds and find their way to you soon. There will be a lot of singing over the next few months. Thanks to the imminent release of the third Blasphemous Tome, we have had a surge of new Patreon backers. Many of these people have been generous and brave enough to pledge at the $5 level. This means that we currently have a backlog of around 10 people to praise through song. Putting more than two songs in an episode risks our vocal cords, your sanity and the very fabric of the universe. It is only prudent for us to work our way through these thanks cautiously. With great cacophony comes great responsibility. If you are still waiting, please bear with us — your song will come soon. Enjoy the sense of creeping dread until then. We’re back and we’re making offerings to twisted idols, praying in inhuman tongues and performing rites passed down through strange aeons. 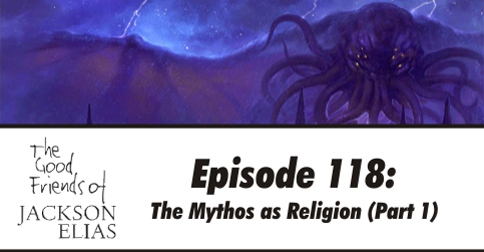 This is our look at the role religion plays in the Cthulhu Mythos. Specifically, we try to make sense of how worship of the Great Old Ones relates to more wholesome beliefs. To do so, we break down some of the common elements of world religions and see how they might map onto Mythos sects. 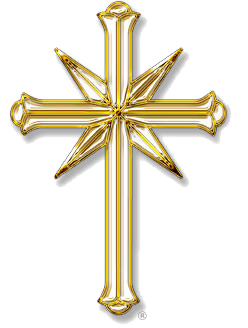 We appreciate that this ventures into some sensitive areas and we try to remain respectful of the beliefs of others. Our motivation is to try to make the cultists in our Call of Cthulhu games a little more three-dimensional. It’s easy to see a cultist as just a lunatic in a robe, waving a sacrificial dagger and trying to bring about the end of the world. Belief is a lot more complicated than that, however. Thinking about real religions can fill in some gaps in how we present these most common antagonists in our games. It’s very easy to dehumanise cultists, seeing them as little more than Call of Cthulhu‘s answer to orcs. By thinking about why they believe what they do and how they express these beliefs, we might be more inclined to interact with cultists in more interesting ways than just shooting them in the face. Especially when there are so many other places you could shoot people. This is the first of a two-part discussion. 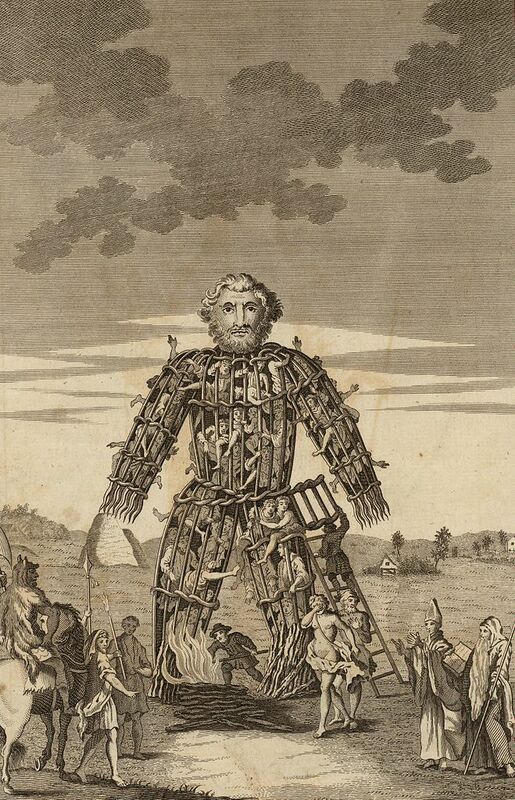 Next episode, we will build on what we have learned and think about how to make Mythos cults more interesting. 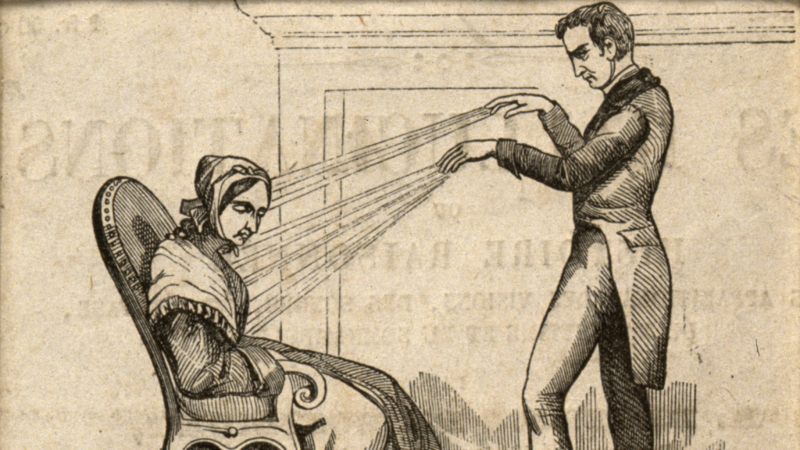 We will also brainstorm a few original cults, armed with our new insights. We are almost ready to go to press with issue 3 of The Blasphemous Tome. This is the annual fanzine we produce for those lovely people who back us on Patreon. 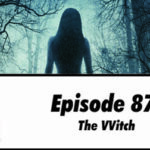 And there is still time for you share in the horror! We will send copies to everyone who is a backer by the end of this year, although if you’re quick, you’ll also get one of our special Christmas cards in the same envelope. If you need any more encouragement, take a look at the gorgeous cover image that Jonathan Wyke has created for us. 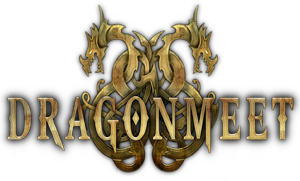 And a quick reminder that at least some of us will be at Dragonmeet this weekend. Please track us down and say hello. We’ll leave a scent trail to assist you. Oh, and we mention the great Fricker Halloween party of 2017. 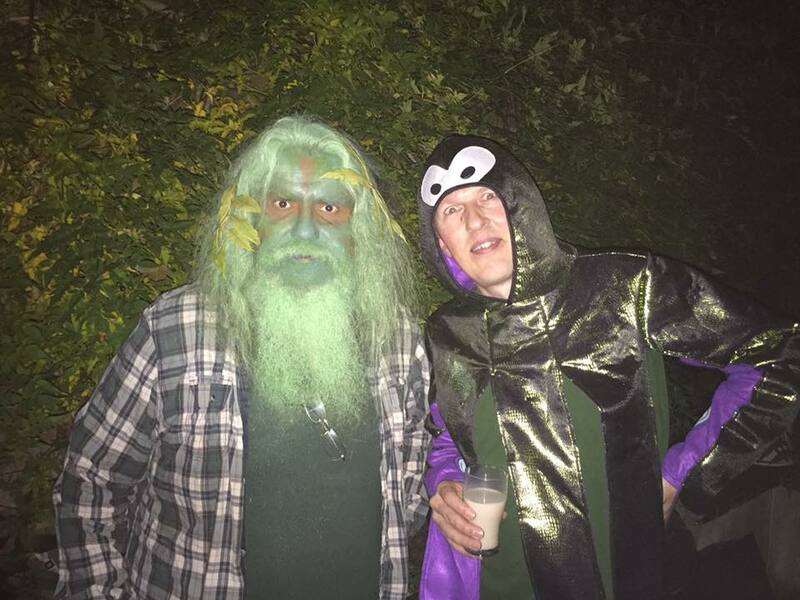 Unfortunately for us, Scott’s ill-advised dalliances with greasepaint and Paul’s unrecognisable octopus costume were captured by Mike Mason. Those of a sensitive disposition may wish to look away now. We’ll be waiting for you in your nightmares. There are new songs in this episode, neither of which are ever likely to feature on Songs of Praise. We have had several new Patreon backers recently, possibly because of the imminent Blasphemous Tome. Once again, this means that we have built up a small backlog of people to sing to. 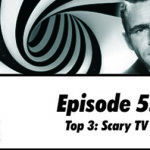 Time constraints and common human decency mean that we limit ourselves to two songs per episode. If you are still waiting for your aural assault, it shouldn’t be too long now. 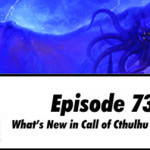 We’re back and we’re digging into another Lovecraft story, looking for the horrors that lie beneath. The Shunned House is one of the more minor of Lovecraft’s major stories, if that makes any sense. It is a lengthy, substantial piece that certainly shares thematic elements with his Mythos tales, if not any explicit continuity. Whether or not this makes it an interesting or worthwhile tale is debatable, and debate this we do! 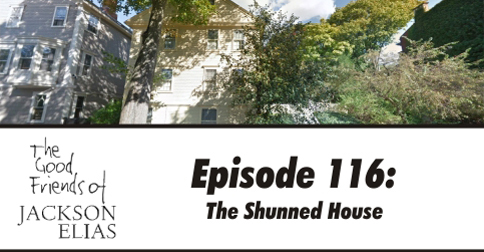 The shunned house of the story is a real place, located on the delightfully scenic Benefit Street in Providence. 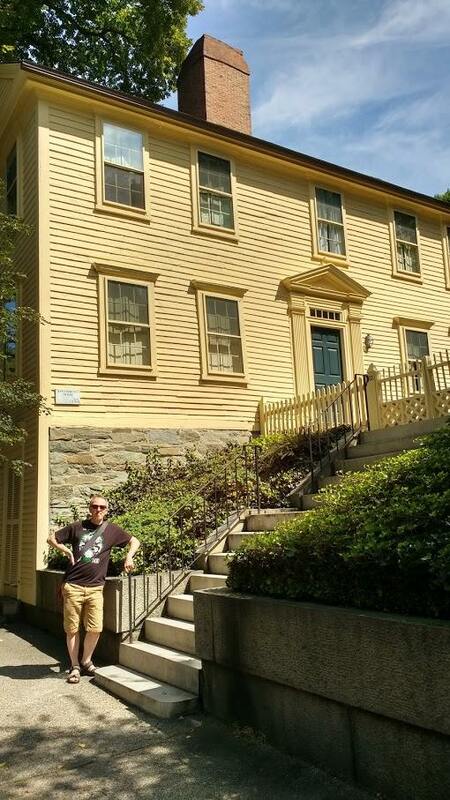 While attending Necronomicon this summer, we took the opportunity to make an unhallowed pilgrimage. It is someone’s home, however, so we did no more than lurk outside like a gaggle of creepy cultists. I imagine the owners are used to this by now. Despite the house’s evil reputation, we escaped with our flesh undissolved and no more than the usual thirst for human blood. Paul shuns the Shunned House by the simple economy of turning his back on it. 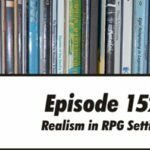 As ever, we also look at the influences that shaped The Shunned House, its handful of adaptations and some ideas about what we can steal for gaming. 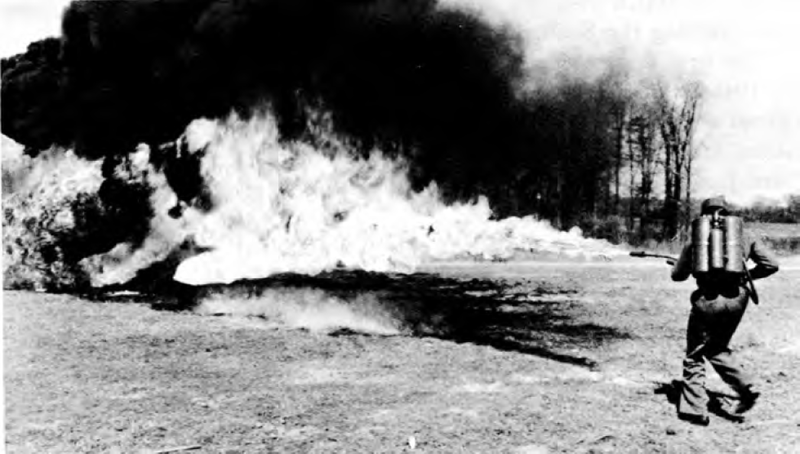 Most of these ideas seem to involve flamethrowers. To be fair, many of our Call of Cthulhu sessions end up this way. In the context of gaming, we also mention Marcus Rowland’s excellent Forgotten Futures RPG. Rowland has used this as a vehicle for adapting many Victorian and Edwardian fiction settings to gaming. 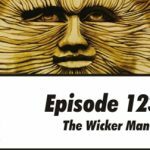 Of specific relevance to this episode is The Carnacki Cylinders, which draws upon William Hope Hodgson’s Carnacki the Ghost Finder. 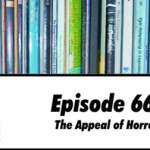 Listeners who like the scientific approach to monster hunting in The Shunned House will find much of interest here. The shadow of Carnacki (possibly cast by his electrical pentacle) lies large over The Shunned House. We also make passing reference to the ongoing Lovecraft Reread column on Tor.com. Along with the HP Lovecraft Literary Podcast, this is one of our favourite resources for gaining insights into Lovecraft’s work. The first episode of How We Roll‘s recording of Blackwater Creek is now out. Scott, who wrote the scenario, takes on the role of Keeper and tries his damnedest to creep out the players. There should be another 7 episodes after this one, with the horror building steadily throughout. We mention in the episode that we recorded the seminar that Paul, Scott and Mike Mason presented at the Milton Keynes Literary Festival. The topic was the relationship between RPGs and fiction, with a special emphasis on Call of Cthulhu. It went rather well, or so we believe, with a good turnout and some lively questions from the audience. Our plan was to release it by now, but it’s not quite ready yet. Keep an eye on your RSS feed and it should be there in the not-too-distant future. Also, we have invited listeners to submit articles and artwork for issue 3 of The Blasphemous Tome. This is the annual fanzine we create and send to all our Patreon backers. If you have a short article (300-1,000 words) or some black-and-white artwork, please send it our way. The deadline is the 20th of November. Once again, there is singing in this episode. As regular listeners know to their cost, we sing the praises of those who back us on Patreon at the $5 level. 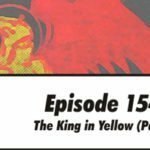 Both subjects of this episode’s songs presented unique challenges, but I think we had the ambition and hubris to tackle them. The refusal to acknowledge one’s limitations will take you further than talent and hard work. Well, that’s what we keep telling ourselves. 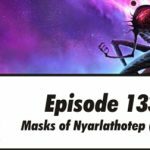 One of the recipients of our merciless song is the actual play podcast, The Esoteric Order of Roleplayers. We promised to link to them in the show, so here we go. Enjoy! We’re back and we’re intimidating goons, charming cult leaders and fast-talking the slow-witted. 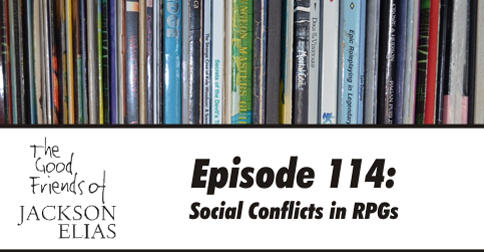 This is our look at the use of social conflicts in RPGs. By this, we don’t mean arguments over whose turn it was to bring the snacks or whether that roll of 00 was really cocked. Instead, we’re talking about the use of social skills in games to resolve conflicts. That said, we do mention a little bit about what to do when out-of-game conflicts bleed into play. Fisticuffs, of course. 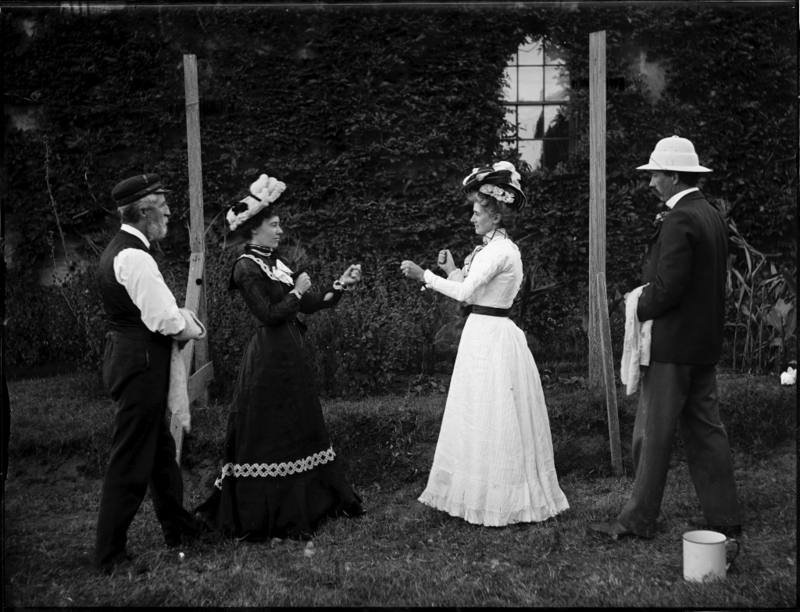 Fisticuffs resolve everything. 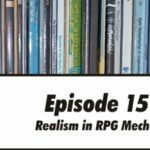 We talk a little about the kinds of things we expect social mechanics to resolve in our games, how we implement them and how we’ve seen them go wrong. Especially in a game like Call of Cthulhu, social conflicts are a vital tool for the players, but not everyone can agree on what they do. Are they a form of subtle influence, a way of cutting through ambiguity or a means to control other characters? Illness prevented us from meeting in person this week to record last-minute inserts. We have tried to use the wonders of modern technology to work around this, so we at least have a news segment. 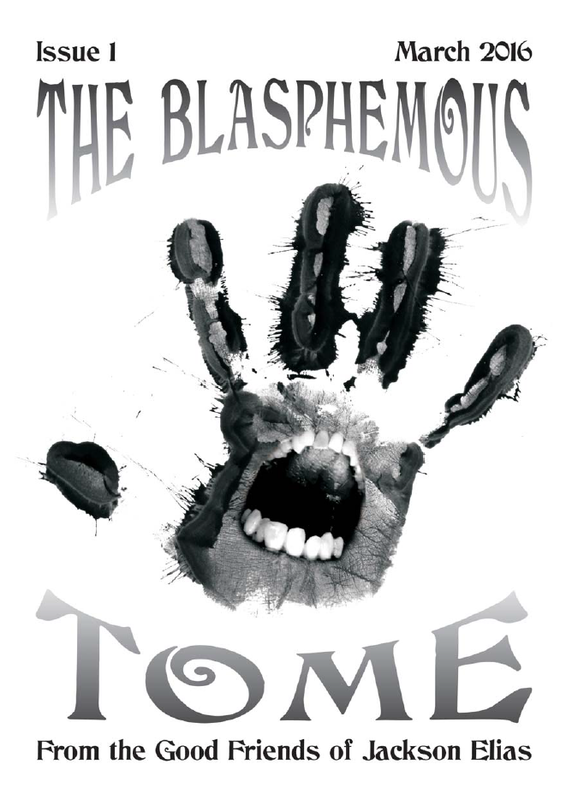 The first thing to report is that we are starting work on issue 3 of The Blasphemous Tome. This is the fanzine we produce for those generous people who back us via Patreon. It only exists in a physical form (unlike its creators, who have transcended and exist on many planes). Our aim this year is to send it out with our Christmas cards. Of course, events may prevent this, but we hope to give you something blasphemous to put under your tree this year. We even taught this issue to sing carols. Well, “sing” “carols”. It’s the thought that counts. The other news item takes the form of some thanks and a mini-review. While we were in the US last month, we were delighted to meet Evan Dorkin at our signing at The Compleat Strategist in New York City. As I’ve mentioned before, Evan has been one of my favourite comic creators since I encountered Milk and Cheese in the early 1990s. 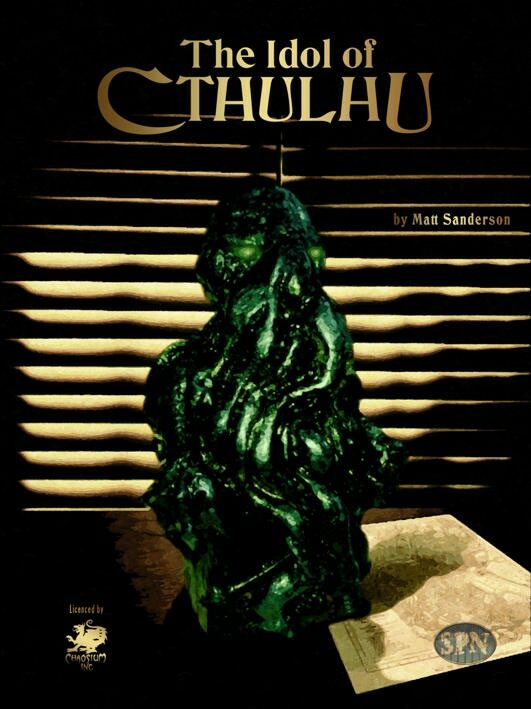 He brought us copies of the first collection of Calla Cthulhu, the new Lovecraftian comic he is writing with his wife, Sarah Dyer. It is an action-packed, young-adult take on the Mythos, which still has plenty to appeal to old farts like me. 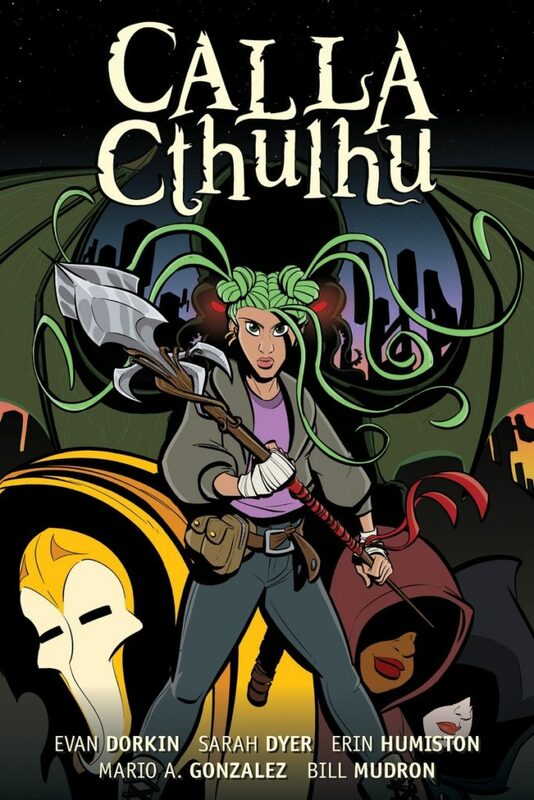 This collection is published by Dark Horse Comics, and you can read Calla’s ongoing adventures via the Stela Comics app. Our inability to meet this week also means that we were unable to record our usual Patreon thanks. We have a couple of people to sing to, but you have been spared for this episode. On the other hand, this should only add to the sense of mounting dread. There is no escape.